Open the Sales Order you need to invoice by going either to Sales > Sales Order or clicking the Sales Order button on the icon bar. If you know the Sales Order number, type it in the Order Number field and press the Tab key on your keyboard. If not, click the magnifying glass next to the Order Number field or press F4 to search for the order. The look up gives the user the ability to search by many different fields. Once you have the order open, click on the Detail tab. You want to be sure you have all items Scheduled which need to be Invoiced. Acctivate will only invoice Scheduled lines. In the order above, Black Tempra Paint is out of stock so they are currently Backordered. 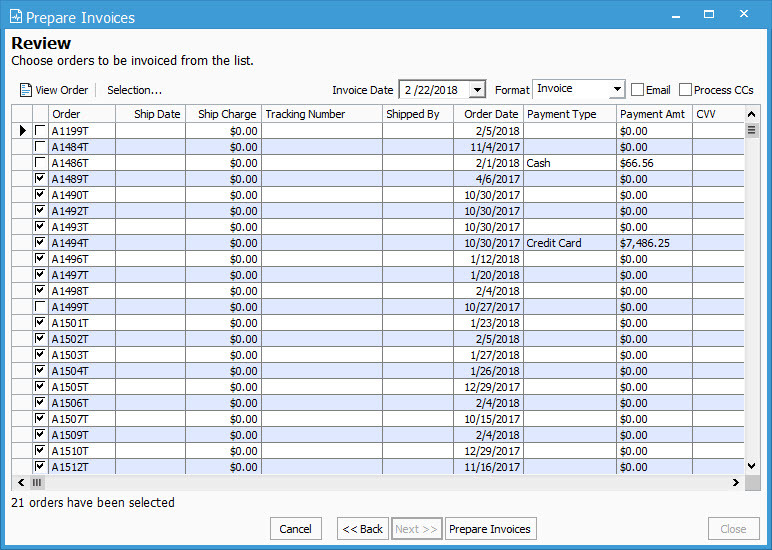 If you wanted to invoice the full order, including Out of Stock (Backordered) items, you would need to change the quantity Scheduled in Edit mode. If the customer is on Credit Hold or is Over Limit, the user will need to release the order before invoicing the order. Once you are ready to create an invoice for your customer, press the Create Invoice button near the top-center of the Sales Order Window. The Invoice Order window will appear. At the top of the window you notice the dates, and the Invoice Format. If you use more than one Invoice form, such as an International Invoice, you can choose which form you would like to use here. If you reprint this invoice in the future, Acctivate will user the Invoice Format selected at time of invoice. You may enter your packaging and shipping information in this window as well. At the bottom of the window you can enter the payment information for the invoice will synchronize the invoice as paid. These fields are all optional, the invoice can be released with or without these fields being populated. If there were items listed as being on Backorder, the Order Status will now be set to Backordered. If all lines were Scheduled, the Order Status will now be Completed. After receiving the backordered items into stock, Schedule the order to process the remaining products. To view your invoices, go to the Invoices tab on the Sales Order window. From this screen, you can Print, Void, or View your invoices. If for some reason you find you have created an invoice prematurely or incorrectly, Void the invoice by highlighting the line and pressing the Void Invoice button. This must be done to edit a completed order. When recreating the invoice, the Invoice Number will match the original number. Navigate to Sales > Prepare Invoices. If the user does this function often, they can add the Prepare Invoices button to their icon bar. 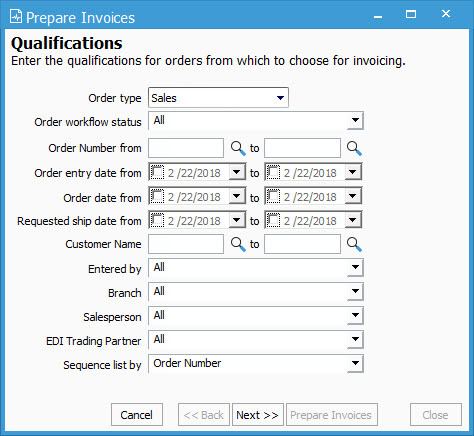 This will open the Prepare Invoices Qualifications window where the user can set certain filters to prepare a specific batch of invoices or prepare all available orders for invoicing. By default, the Sequence will be set to Order Number. This tells Acctivate how you wish to see the next window sorted. Feel free to toggle this option to fit your needs. Once you’ve selected all necessary filters, click Next which will bring up the Review window. This window allows the user to specify the Invoice Date, Invoice Format, Ship Date, Ship Charge, and Shipped by information. If you need to look at the order, click View Order after highlighting the order in question in the grid. When there are email addresses listed on the orders, you can check the Email box to send emails using a message template. If you utilize a CC processor, you can also Process CCs from this window. From the provided list, select the orders you want to invoice by checking the boxes to the left. You can also click the top grey box above the checks to select all or none. Once the specific orders are checked and necessary information added, click Prepare Invoices. Acctivate will go through each order and list the number of invoices prepared vs the number of orders that could not be invoiced. If all orders were ready for invoicing without error, click Finished. If not, click Next to review the list of errors. From here you can View Order with an error listed or Print Errors for your review. Click Closed when ready. This will complete the process and close the window. To print these invoices, follow the steps listed in this article. Navigate to Sales > Order Manager or click the Order Manager icon on the toolbar. 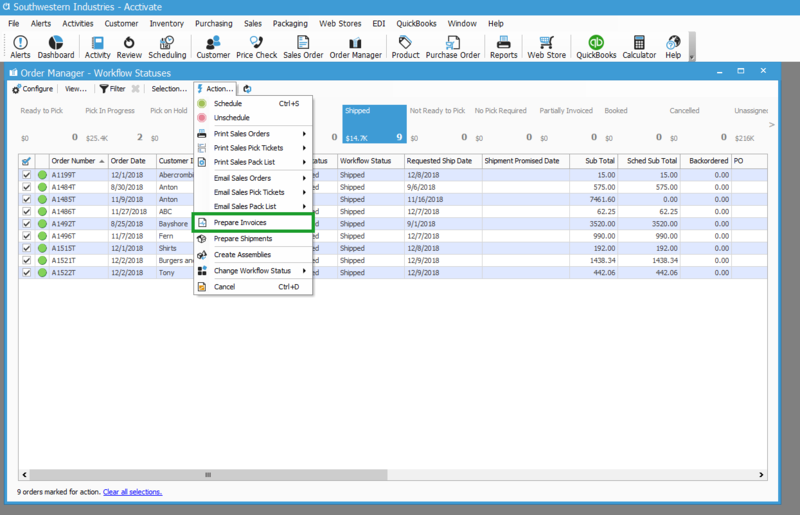 Use the View… menu to select the bar and button containing the orders you want to invoice. Check off which orders you’d like to invoice. After making your selections, in the Order Manager window use the Action… menu to select Prepare Invoices and follow the steps as above.